During my internship, my attending doctor told me that starting a practice or growing a practice requires money…substantial money. He clarified by saying this can come in a few forms. First, you can buy a practice which will cost tens if not hundreds of thousands of dollars. At the time he gave this advice, which was just prior to the global financial crisis, banks were not terribly interested in providing a newly minted physician with six figure student loans and no collateral with this type of loan. The next way to build a practice is to do it purely organically, (i.e. so slowly that while you don’t spend money, you also don’t make money in a reasonable time-frame). This would be the opportunity cost of business building. The final way is to hire a proven coach to work with you step by step to grow in the healthiest, safest, and most sustaining way. As a novice to medicine and business, I of course ignored all of the good advice. Several years later, having chosen the organic method, I realized that having a livable income was important to me. I shopped several coaching groups who catered to my profession and was underwhelmed. However, I found a business development coach on the periphery of my industry who intrigued me. She and I sat down (virtually) for a 30-minute hash session of my dreams, goals, and aspirations for my practice and my brand. After spewing out all of the fluff and answering her difficult questions, it finally occurred to me, via limbic influence, what I had known logically for years. 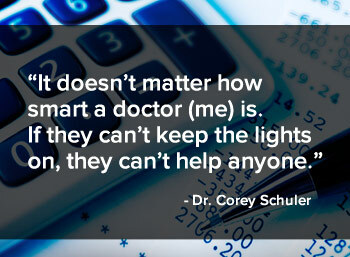 It doesn’t matter how smart a doctor (me) is. If they can’t keep the lights on, they can’t help anyone. We scheduled more time together. We next met for 90 minutes and created a blueprint, then for 60 minutes and another 60 minutes all within six weeks. Each session she gave me heavy lifting assignments that had an immediate impact on my practice. I didn’t realize how many mistakes I was making both tactically and strategically. After final implementation (I only implemented a fraction of her ideas due to a limit of my own energetic resources) I had grown my business by 400%. For those doing the math at home, that’s 4x what I was doing less than 2 months earlier. Instead of hoping and wishing for new patients and enough income to pay my rent, cash flowed, with plenty of money left over. That was all I needed. We didn’t initiate a long-term relationship. I didn’t sign a contract. She helped me when I needed it and I paid her for her time. And now, as I embark on new challenges of building and sustaining a business, I know I can call my coach again and she’ll help me through it again. Taking the focus off me, I now understand the importance of having someone objectively and expertly review business systems, strategies, and vision. We can’t be all things in a business naturally. Even as physicians, some are better at long-range goals and brand building and other are best at nitty-gritty hand-offs and day-to-day tasks. Regardless, where our strengths end, it would be good to have a partner at the ready who is cognitively but not emotionally invested in your business.